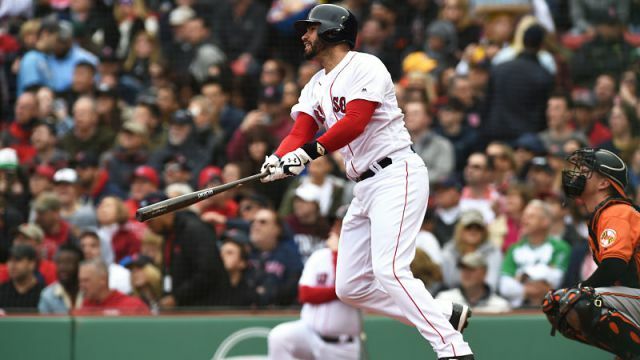 Less than 48 hours after he leaving Thursday's game after being hit by a pitch, Hanley Ramirez doubled and homered driving in three runs in a 10-3 Red Sox win over the Orioles at Fenway Park. Ramirez followed an Andrew Benintendi RBI single in the bottom of the first with his third long ball of the season to give Boston an early 3-0 lead. His double in the fourth would extend the lead to 7-0. J.D. Martinez (pictured) had three hits in the win including his third home run of the year. Blake Swihart, Benintendi, Brock Holt and Tzu-Wei Lin each had two hits. Hector Velazquez improved to 2-0 for the year going five innings and allowing just a pair of runs. He scattered six hits and walked one while striking out five. With the win, Boston improved to 12-2, the best start in team history.